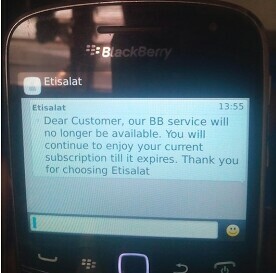 Etisalat Stops Blackberry Internet Services (BIS) - Checkout! You are Here in Home » Freenet » Etisalat Stops Blackberry Internet Services (BIS) - Checkout! Etisalat unlimited browsing BIS was the one all Ballowapaz was using sometimes ago, both adult and young ones was blazing hard on it by using psiphon as Vpn. Today, etisalat has decided to stop the Blackberry Internet Service (BIS) from blackberry phones which means "No More Blackberry Subscription". "Dear Customer, our BB service will no longer be available. You will continue to enjoy your current subscription till it expires. Thank you for choosing Etisalat"
So if you are still using blackberry phones, kindly throw the phone away and migrate to Android Device and enjoy many features. Not long ago, WhatsApp and Facebook was disabled from blackberry OS (operating system). So blackberry will be completely useless if other networks in Nigeria like Airtel, MTN and glo also disable their BIS from them. Is it helpful? What do you have to say about this?